“And You Will Know Them By Their Love” from Christian Faith Publishing author Mary Lynne Puckett is a guide to a happy, long-lived marriage. From the experiences of her own marriage, Mary Lynne Puckett helps struggling couples renew their marriages. “And You Will Know Them By Their Love”: a guide to a happy, long-lived marriage. “And You Will Know Them By Their Love” is the creation of published author, Mary Lynne Puckett. Mary Lynne and her husband LV currently live in Oklahoma with their two cats, Ducky and Gee Gee, as well as their dog, Hula. They like to turn fast-food into serious dining, tell jokes, and fall asleep watching Andy Griffith. They cannot wait to be together and hate to be apart. Their one goal each and every day is to make someone, who is lonely or sad, smile. LV wants to live to be 120, so he can be with Mary Lynne as long as possible. She sure hopes he cannot see by the time they reach that age. Published by Christian Faith Publishing, “And You Will Know Them By Their Love” offers solutions for struggling couples from author Mary Lynne Puckett’s own marriage. Also, the examples presented in this book come from couples who were helped by Mary Lynne and her husband. It offers examples of how husbands and wives can truly accept and enjoy each other again. “And You Will Know Them By Their Love” is formulated for both husband and wife to read and learn together. Each chapter is filled with enlightening information that will surprise, bring a chuckle, and trigger a few tears. It begins with a wife’s dilemma. It progresses from her frustrations to genuine hope. A Biblical truth is pulled out and turned into a way of thinking called “passing the test.” It touches on how to control unkind habits and change these habits with the positive goal of renewing the love couples once had, thereby giving perspective on how married life can be happy and long-lived. View a synopsis of “And You Will Know Them By Their Love” on YouTube. 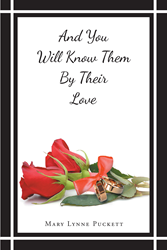 Consumers can purchase “And You Will Know Them By Their Love” at traditional brick & mortar bookstores, or online at Amazon.com, Apple iTunes store, or Barnes and Noble. For additional information or inquiries about “And You Will Know Them By Their Love”, contact the Christian Faith Publishing media department at 866-554-0919.